Don't neglect the leftovers station. 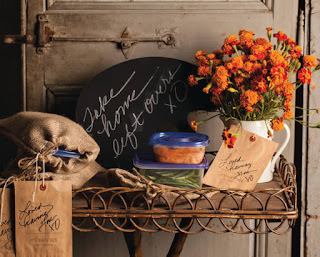 Use a chalkboard to write out a message to your guests so they don't forget to grab their snacks. For a personalized touch, wrap their take-home food in burlap sacks with a handwritten note. 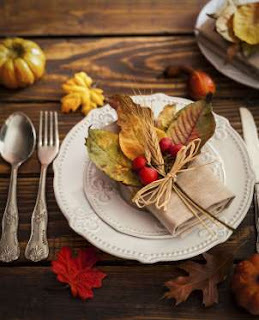 Celebrate fall foliage by collecting colorful leaves and pairing them with straw and berries for an unforgettable place setting. 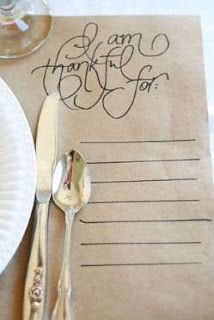 Try your hand at a meaningful DIY, like this handmade placemat, from Clarita at Skies of Parchment, that gives guests the chance to reflect on what they're thankful for before digging into dinner. Autumn touches of nature grace this pretty Thanksgiving napkin ring. Set your table and wrap napkins in ribbon, twine, pine, dried leaves, etc and then add a tag with the name of the person or a sweat Thankful sentiment. 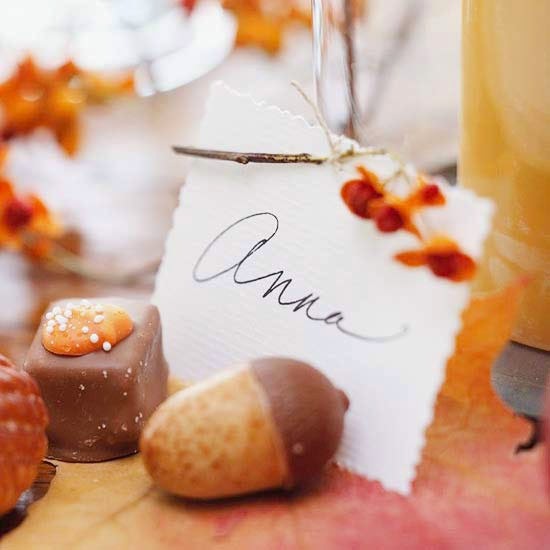 Surround plain name tags with tidbits from nature, such as nut-decorated candies (for dessert), acorns, or leaves. Copper pipe fittings can add subtle shimmer to a Thanksgiving table. 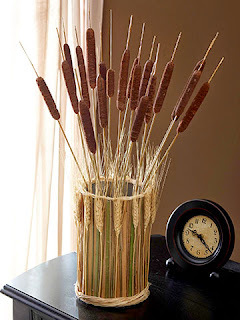 Gather ornamental grasses in a bunch and cut the ends flush. 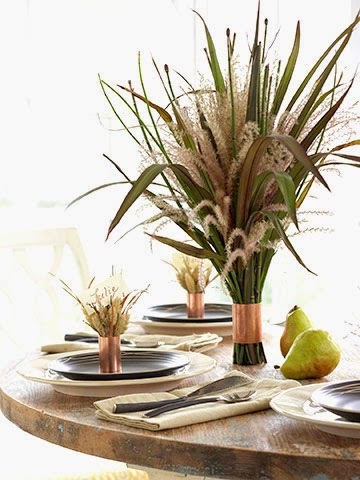 Slip a copper fitting around the bouquet to create a Thanksgiving centerpiece. 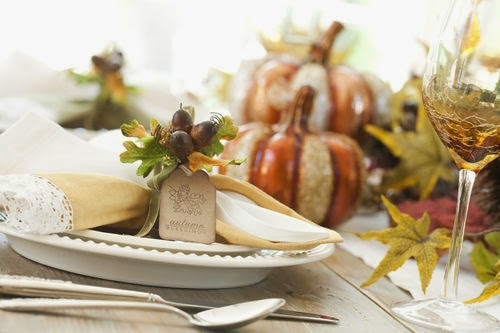 Arrange sprigs of grass in smaller pipe fittings and add a name tag to make place cards. 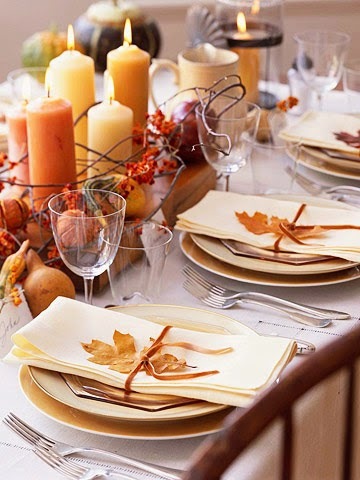 While nature has plenty of color to offer during the fall season, its classic neutrals also serve well for Thanksgiving decorating. Cattails, wheat, and ornamental grasses combine to create a tactile accent for your table or buffet.